Imagine yourself in the late 19th century, in a romantic era of peace & prosperity called the “Belle Époque”. Bucharest was a city where the West met the East, instantly charming travelers with its multicultural diversity, Boehme lifestyle and gorgeous architecture. Back then, the flourishing city was experiencing the greatest cultural boom of its history, with King Carol the 1st being the mastermind behind it. His family ties with Napoleon the 3rd or Wilhelm the 1st amplified the process, turning Bucharest into a Paris of the East. This Bucharest private tour is structured as a story, taking you along the famous Victory Boulevard and through the fully restored Old City. Each major attraction has its own tale to tell, allowing you to go back in time and discover the social and cultural life of the era. We’ll see beautiful palaces and historical buildings – architectural gems displaying a mix of styles: Neoclassic, Art-Nouveau, Baroque or Byzantine blended in with the local Brancovenesc. Along the way you can admire various impressive buildings – hotspots for the era’s high society: the palace of one of the most famous composers of 20th century; the Athenaeum music hall; the former Royal Palace; the Capsa Restaurant (meeting place for noblemen & artists); the former Lafayette Galleries (providing latest Parisian fashion) etc. Next, we’ll enter the Old City – an area bursting with life that truly resembles the charm of the Belle Époque: old street lamps, vintage cafés, bistros & lounges nested within 18th century houses or street musicians playing the violin. Some places are former cabarets, theaters or dance halls while other still continue a century old tradition, operating as inns and beerhouses. Take the Belle Époque Private Tour to feast your eyes with architectural wonders and to journey back in time…In a time of Tango & Charleston dances, balls permits, jockey clubs, fringed dresses and secret love letters! I came to Romania with some friends and wanted to see a different side of Bucharest. After doing some research, I stumbled upon one of Unveil Romania’s city tours – “Charm of the Belle Époque”. It proved to be a solid choice, as we all enjoyed ourselves while learning about the cultural boom that occurred during the reign of King Carol the 1st. We were able to see his legacy as we admired impressive neoclassic architecture, fully restored mansions and an old neighborhood with beautiful, well-preserved houses. If you’re a fan of old architecture and stories with kings, this is the tour for you! Duration: 4 hours. Refreshment/coffee stops can be requested. Transport: Hotel pick-up/drop-off by car. Walking distance: 3.5 km, slow-paced. Ask questions at any time on the things you like. Deeper understanding of the Belle Époque era: photos & authentic postcards, coins etc. Victory Avenue: most charming street of Bucharest, often compared to Champs Elysées. It represents the city’s core architectural & cultural patrimony – a visual reminder of Bucharest’s most glorious era. The Royal Palace: neoclassical style, the palace was home to Prince Cuza and King Carol I – the men who modernized Romania in the 2nd half of the 19th century. The Romanian Athenaeum: the country’s most prestigious concert hall with outstanding acoustics. This architectural masterpiece is at the center of the George Enescu International Festival. The Palace of the Savings Bank: boasting one of the most impressive neoclassical facades in the city, this 19th century palace was built in the most eclectic french style, topped by a glass & metal dome. Old city center: large pedestrian area, cobblestone streets full of charm and elegance, baroque architecture and vintage cafes. 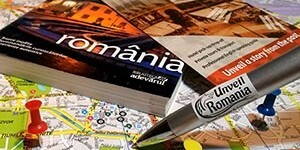 It’s also a hotspot for Bucharest’s nightlife – loads of bars & pubs are open all night long. Other major landmarks: The Cantacuzino Palace, Macca Vilacrosse passage, Stavropoleos Monastery, The Military Club, Caru cu Bere Inn, National Bank Palace, National History Museum and many other. 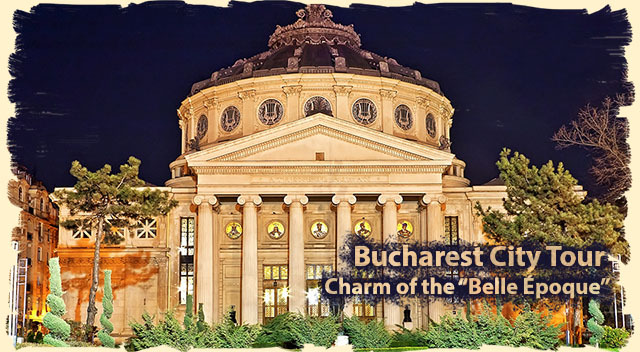 Book the Belle Epoque – private Bucharest city tour! The charm of the “Belle Époque” is more than a tour. It’s a feast for the eyes and a joy for the soul! Go back in a time of romance, Boehme lifestyle and marvelous architecture!